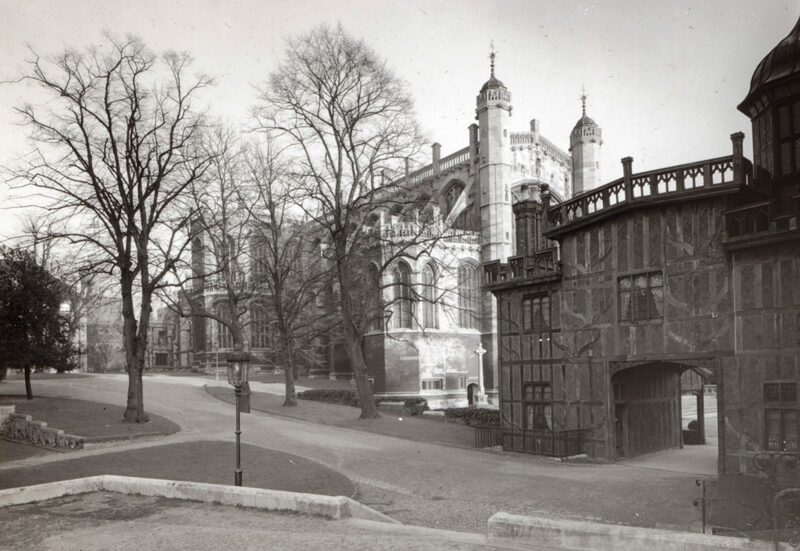 In 1829, the Dean and Canons of Windsor reached agreement with the Windsor Royal Gas Light Company to install gas lighting in the College, namely in the Dean’s Cloister, Canons’ Cloister, Denton’s Commons and the Horseshoe Cloister. Two years earlier at a meeting of the newly formed gas company in November 1827, a shareholder mentioned that “it was the intention of the Dean and Canons of Windsor to light the Cathedral and Cloisters with gas”. The Windsor and Eton Express reporter who attended the shareholders’ meeting was enthusiastic about the introduction of resin gas lighting to the Royal Borough, with the sanction of King George IV. The endorsement of the Dean and Canons may well have assisted the gas company in its endeavours to win over the resistant element in the town’s population and before long the College benefited from improved lighting in the Cloisters. Indeed, in June 1830 the Canon Steward sought an estimate from James Bedborough, one of the founding trustees of the company and joint proprietor of the Windsor gas works, for fixing six additional gas lamps in the Cloisters. Although gas was not introduced into the Chapel itself until sometime later, James Bedborough supplied gas to the College for an annual fee which, in the early 1830s, amounted to £80. By 1838 the Windsor Royal Gas Light Company was supplying the Dean and Canons with gas for seventeen lamps. James Bedborough, originally a stone mason employed by Sir Jeffrey Wyattville on George IV’s major reconstruction of Windsor Castle, became a man of influence in the town, not only as a supplier of gas lighting but also as a property developer, railway speculator, Alderman and Mayor. His son, Thomas James Bedborough, was to be employed by the College during the 1840s restoration of St George’s Chapel, following in his father’s footsteps as a stone mason, builder, gas company director and member of the town council.